Hannah Genders enjoys one of the best years she can remember at Chelsea. If you read my last article on the Malvern Spring show you will know that I was a bit disappointed with the show gardens there this year. Well, I have to say that the Chelsea Flower Show made up for it, and I think it was one of the best Chelseas I have ever been to. If you managed to watch any of the television coverage you will know that many of the big design names were missing from Main Avenue this year. Main Avenue runs the length of the show and is the place to find all the larger show gardens, measuring 25 by 10 metres. This is where you usually find the big names and also the big money behind them, but not so much this year – there were a few “budget” gardens and the overall number of gardens in this category was down from 22 last year to just 12. However, I think this made for some really exciting, accessible displays. Talking of accessible, the Marshall’s garden, which is one of the largest as they sponsor the whole show, was designed by Ian Dexter. 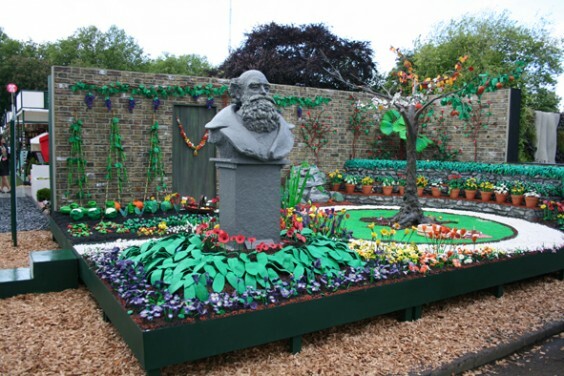 He had come up with the great idea of turning the show garden into four smaller plots and creating a street scene of front gardens, each with a different story to tell. On press day, Ian had organised a piece of live theatre, telling little cameo stories in each of the front gardens and down the street. It was performed by professional actors and gave such a lively, vibrant feel to the show. I loved it. Further up Main Avenue, amongst the large, expensive gardens was a very different garden, designed by Paul Stone and brought together by the Eden Project. This garden, called “The Key”, was grown, built and planted by projects from all over the UK, working with 200 homeless people and prisoners from six jails who helped to grow the plants. The aim of the garden was to show what anyone can achieve given an opportunity, and it did have a sense of hope about it – there were some lovely touches, like the name of the person who grew the plants on the front of a row of lettuces. Another large garden booked by an Australian team was pulled at the last minute due to lack of funding, so the RHS decided to give the space to a great designer called Sarah Eberle, asking her to come up with three gardens in the space at a budget price of £5,000 each. The average spending on a garden of this size can range from £150,000 to £250,000-plus. The RHS provided the backdrop and Sarah came up with three “credit crunch” front gardens. They were all stunning in their own right, full of quirky ideas and so much more attainable for the average gardener. One of my favourites was a garden called “Future Nature”, which was all about recycled materials and planting to suit different environments in order to bring colour, wildlife and interest to brownfield sites. It was very creative and even contained a vertical garden tower to inspire anyone who was short of space; this contained plants and wildflowers along with loads of recycled materials in a sort of totem pole sculpture. I thought this garden was great and very inspiring to anyone interested in the role plants can play in an urban setting. The little gardens, ranging from the urban gardens in the main showground to the little rural gardens round the back in Ranleigh Gardens, were packed with new ideas – none being newer or more daring than the plasticine garden. This created some controversy, as the rules strictly say no artificial flowers, either plastic or silk, in a Chelsea garden. The creator James May was there on press day and I managed to have a chat with him about his garden. He is passionate about old-fashioned toys and is doing a series for the BBC to be shown later this year. Each programme will feature a different toy and for the episode about plasticine, he decided to make a garden from it. I must say I loved it; it was such good fun. James told me it took two-and-a-half tonnes of plasticine and about 2,000 people to help make all the flowers, tree, fruit and vegetables. Even the soil was made from plasticine, and the RHS in their wisdom made him a Chelsea gold medal out of plasticine too! Not only were the gardens fabulous, the great marquee was a good as ever, and I am told that the whole show sold out a day earlier than last year. I hope any of you who attended enjoyed it as much as I did.